If you were to ask me to list my top three most hated foods, the list would most certainly include mayonnaise. I just can’t stomach it and therefore I steer clear of a lot of summer favorites such as potato salad, macaroni salad, and chicken salad. This recipe is my solution to that problem and is probably one of my favorite new recipes I’ve come up with in the last couple of months. It’s very satisfying but not overly heavy, and if you buy a rotisserie chicken to use, you won’t even need to turn the oven on. An added bonus is that it’s a little healthier given that mayo has a good amount of calories in it. The “hardest” part of making this salad is the prep work, other than that it comes together in a snap and is a great make ahead lunch or light summer supper. When we had this for dinner a couple of weeks ago we served it with a lightly toasted flatbread and some mixed greens but you can certainly enjoy it alone, either warm or cold. 1. Prep and chop the chicken, tomatoes, cheese, prosciutto, artichokes, and red onion. Add to a large mixing bowl. 2. In a small bowl mix together pesto and yogurt. Add to the larger with the other ingredients and toss to combine thoroughly. Season to taste with salt and pepper. Allow to sit for at least 15 minutes before serving to allow flavors to develop. Such a great idea and so much lighter than being doused with mayo. Those pictures are making my mouth water - they look so delicious! Interesting take on a typically calorie-laden dish. I'm imagining loading it inside a pita pocket on-the-go! 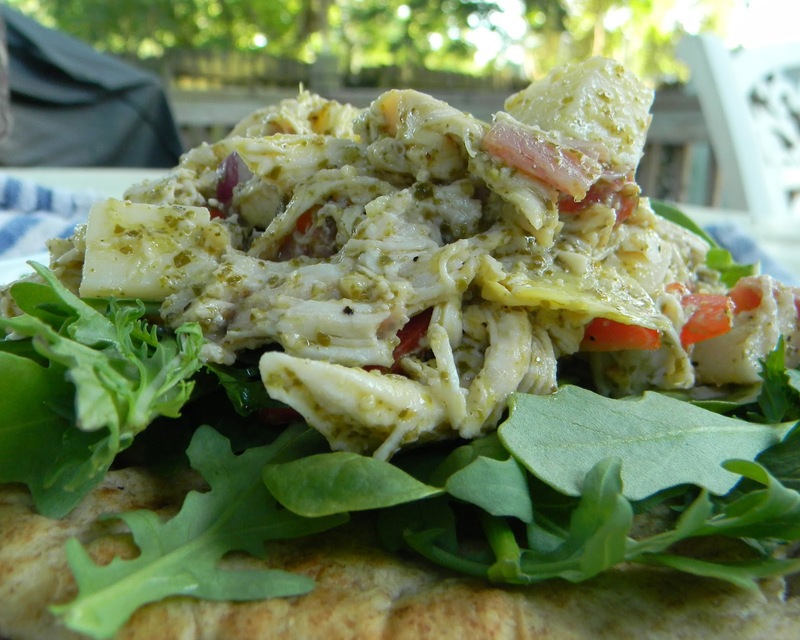 Toasted flatbread goes well with the chicken salad dish. Sounds fabulous! Can't wait to try it! Yum! Nothing, and I mean it, nothing I love better than roast chicken and all the leftovers you can play with! This is such a great idea! 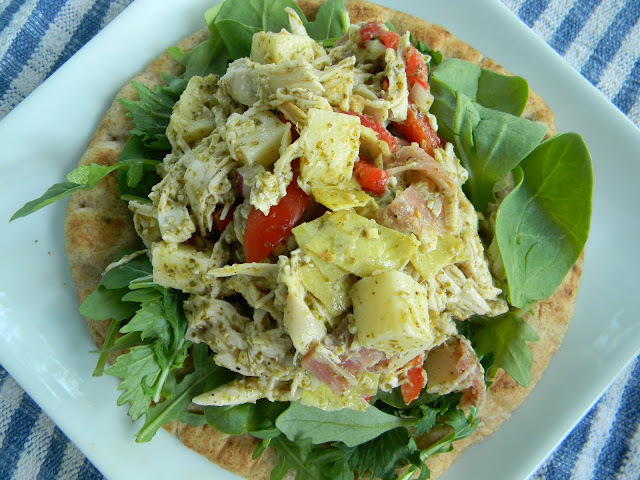 I am usually not a fan of chicken salad, but this looks delicious! This sounds delicious and I will try it! I usually dress the chicken and vegetables with a simple vinaigrette the night before then finish with mayo just before I serve it.. I love mayonnaise and only ever make my own from scratch. It's so easy to do and I know exactly what's in it. Try tarragon vinegar for the best flavor IMHO. I'm curious though, why do you hate mayo? I've known people who do, I just never got that. Thanks for the blog. @Anon... I can't really tell you why other than I don't care for flavor and it just looks gross to me. I've also broken out in hives after accidently eating it, so that doesn't help either. My black thumb strikes again!